Biotic resistance by native communities could have a role in the spread of invasive species. This seems to be the case in the invasion of the Argentine ant, Linepithema humile, but only when the environment is unfavorable for the survival of the invader. We studied the progress of Argentine ant invasion through favorable and unfavorable habitats of Doñana National Park across three temporal snapshots covering three decades (1992, 2000, 2016). We assessed biotic resistance of the native community using species richness, as well as dominance and community structure. We also explored the role of abiotic factors (quality of surrounding habitat and spatial variables) and of potential vectors of Argentine ant dispersal across unfavorable areas. We found no evidence of biotic resistance after examining native ant species richness, proportion of native dominant ants, or community structure. On the contrary, invasion proceeded from trees with higher ant species richness, probably because those trees are larger and provide more resources and better protection from aridity. 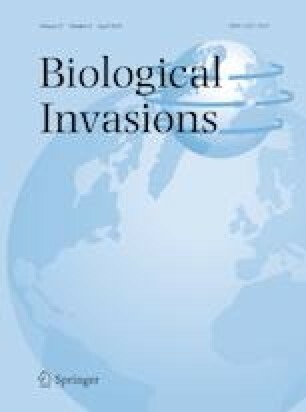 Furthermore, we found evidence that the invasion of new trees across a matrix of unfavorable habitat could be influenced not only by humans, but also by scavenging avian predators, which could act as vectors of ant dispersal through transport of carrion also exploited by the ants. Such leapfrog expansion through mobile predators could represent an overlooked mechanism that would enrich our understanding of invasion dynamics and provide potential opportunities for management of invasive species. The online version of this article ( https://doi.org/10.1007/s10530-019-01971-5) contains supplementary material, which is available to authorized users. We thanks X. Cerdá, the ant ecology group (ant-ecology.eu), and Luis Santamaría for their scientific input; C. Ramo and the LAST-EBD for their help with the geographic location of trees, NDVI index and GIS data; C. Nell, J.M. Vidal-Cordero, and P. Alvarez-Blanco, for their help with statistical issues; and J. Rainbow for editing the manuscript. Fieldwork facilities were provided by ICTS-RBD. This study was founded by the Spanish Ministry of Economy and Competitiveness and FEDER (CGL2013-43660-P to E.A. ; CGL2015-69445-P to F.S. ), the Ph.D. fellowship program (to S.C., BES-2014-067627) and the Ramón y Cajal Program (to E.A., RYC-2010-06663).